WILKES-BARRE -- The King's College football team will look to register a third straight win when the Monarchs host Middle Atlantic Conference rival Albright College Saturday at 1:00 p.m. at McCarthy Stadium. The game will be part of Family and Friends Weekend at King's. King's enters the game with a record of 3-4 overall and 3-3 in the MAC while Albright is 6-1 overall and is locked in a three-way tie for first place in the MAC at 5-1 with Delaware Valley and Stevenson. The Monarchs are in search of a third straight victory after earning wins over Lycoming and Misericordia in its last two games. Abright, meanwhile, is looking to rebound after seeing its six-game win streak end on Saturday at the hands of Delaware Valley. The game will be available online via LiveStats and Live Video. Go to the following links to access both. Saturday is game-eight for both King's College and Albright College and also the seventh game of the MAC schedule. The Monarchs enter the contest with a 3-4 overall record and are 3-3 in the MAC. Albright is 6-1 overall and 5-1 in the MAC with four regular-season games remaining. This is the 21st meeting between the teams with Albright holding a 14-5-1 advantage, including a 30-24 overtime victory last season in Reading. The last time the teams played at King's McCarthy Stadium, Albright posted 48-29 victory. Albright has won the last eight meetings with King's. The Monarchs last win over Albright was a 38-14 home triumph in 2006. Monarch mentor Jeff Knarr is in his sixth season at King's and owns a 17-40 career record. Albright coach John Marzka is in his ninth season and is currently 65-30 with the Lions. 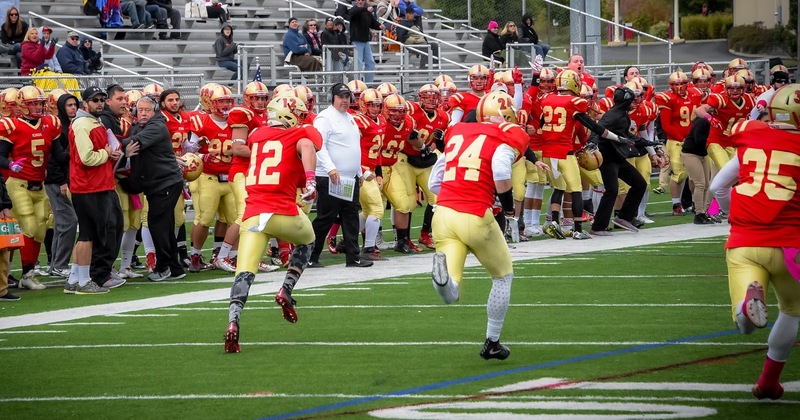 King's won its second straight game with a 28-14 road win over MAC and local rival Misericordia University. Albright suffered its first loss of the season in a 28-23 defeat at home at the hands of Delaware Valley. The Monarch offense seventh in MAC scoring at 21.0 points per-game. The Monarchs are last in total yardage in the MAC, averaging 276.7 yards per-game. The Monarchs are seventh with 170.7 passing yards and seventh in rushing at 106.0 yards each contest. Senior quarterback Tom Hehre, is seventh in MAC passing efficiency at 102.6 per-game. He has completed 111-of-192 passes for 993 yards with five touchdowns and seven interception He has also rushed for 155 yards on 55 attempts with five touchdowns. Freshman tailback Gabe Brown owns a team-high 364 rushing yards on 100 carries with three touchdowns. Brown has also caught nine passes out of the backfield for 35 yards. Junior Zack Funk adds 233 yards on 49 carries with two scores and became the first Monarch running back to crack the 100-yard plateau when he ran for 111 yards versus Misericordia. Junior Mike Palmer tops the receivers with 35 catches for 396 yards and three touchdowns while sophomore Matt Demarco, a transfer from Division I-AA Monmouth, follows with 30 receptions for 272 yards and one score. Sophomore split end Marquis Miller has 24 catches for 180 yards and two touchdowns while fellow sophomore Tyler Marroni has 10 receptions for 111 yards. King's offensive line features four returning starters from last season, including senior center Mark Vetterlein, senior tackle Evan Foster, junior guard Andrew Zub, and junior tackle Jake Dever. The Albright offense is first in scoring in the MAC with a 37.1 points per-game average. The Lions are fifth in the MAC in total yards with 368.1 yards each contest. Albright is third in passing yardage at 222.9 yards while standing fifth in rushing with 145.2 yards each game. Leading the Lion offense is freshman quarterback Mike Knight who stands first in the MAC with a 133.2 passer efficiency rating. Knight has completed 120-of-187 passes (64.2 percent) for 1,249 yards with nine touchdowns and seven interceptions. A dual-threat quarterback, he has also rushed for 241 yards on 64 carries with two touchdowns. Pacing the Lion receivers is sophomore Malik Jackson with 34 catches for 318 yards and one touchdown. Junior Vinny Williams follows with 30 receptions for 320 yards and two scores. Junior Malik Gilmore adds 24 catches for 363 yards and two touchdowns while junior Gerrod Gainer has made 18 receptions for 308 yards and three touchdowns while sophomore Khari Jefferson chips in with 10 catches for 89 yards with three scores. Junior Brian Wickkiser tops a deep Albright running game with 263 yards on 64 carries with six touchdowns. Sophomore Roemello Monroe has 252 yards on 67 rushes with three scores, while sophomore Chris Dawson has tallied 207 yards on 57 carries with four touchdowns. Albright also has the best kicker in the MAC in senior Dan Sobolewski who has made 10-of-14 field goals with a long of 51 yards. The Monarchs defense enters the game standing sixth in scoring defense in yielding 24.4 points per-game. The Monarchs are ranked fifth in total MAC defense, allowing 362.7 yards of total defense per-game. King's is eighth against the run in yielding 188.3 yards while standing fifth against the pass in permitting 174.4 yards through the air. The group is led by junior linebacker Bobby Russell who has a team-high 46 tackles with three forced fumbles, two fumble recoveries, one interception, one sack, and one blocked field goal. Senior defensive end Michael Martina who follows with 44 tackles, 9.0 tackles for loss with 6.5 sacks and one forced fumble. Sophomore safety Jake Manetti adds 40 tackles and two interceptions while senior safety Anthony Martuccio adds 36 tackles with two interceptions and two forced fumbles. Senior linebacker Chad Curtice has registered 28 tackles with 5.0 tackles for loss and 2.0 sacks while sophomore linebacker Hassan Maxwell has 25 tackles with 2.5 tackles for loss. Senior linebacker Monroe Sherman has contributed with 20 tackles while sophomore cornerback Justin Foster posts 18 stops. Senior cornerback Justin Burke has registered 16 tackles with an interception and five pass break-ups while sophomore lineman Jacoby Foresman has netted 16 tackles with 5.5 tackles for loss and 3.5 sacks. Freshman linebacker Bruce Damon checks in with 16 tackles while senior linebackers James Burke has made 14 tackles. Senior cornerbackTyler Mejasic chips in with 13 tackles and an interception. The Albright defense is ranked third in scoring defense in the MAC as the Lions allow just 14.1 points per-game. Albright is third overall in the MAC in allowing 285.6 total yards each game. The Lions are fourth against the pass in yielding 168.4 yards and are fifth versus the run in surrendering 117.1 yards on the ground. Junior linebacker Kevin Mason tops the defense with 50 tackles and three forced fumbles. Senior linebacker Steve Barroso follows with 46 tackles with 5.0 tackles for loss, four interceptions, three fumble recoveries, and two forced fumbles. Senior defensive end Jamal Hayden adds 41 tackles with 8.5 tackles for loss and 4.5 sacks while senior linebacker Colton Ryan contributes 37 tackles with an interception. Sophomore safety Luis Quinones has made 29 tackles with an interception while junior safety Donte Thomas has posted 17 tackles with two interceptions. Junior cornerback JaVaughn Patterson has 25 tackles with an interception while junior defensive tackle Rich Kuhn checks in with 23 tackles with 7.5 tackles of floss and 2.5 sacks. Sophomore defensive end Isaiah Baylor chips in with 22 tackles with 4.5 tackles for loss and 2.5 sacks. As a unit, the Albright defense has 13 pass interceptions in seven games. King's will host MAC leader Albright College at 1:00 p.m. at McCarthy Stadium.